Asking just $22.00 Each -- MUST SELL -- Make me an Offer -- For ANY -- OR Multiple Items !! Buyer to pay U.S. Shipping, or items can be picked up. Cash or Money Order only. 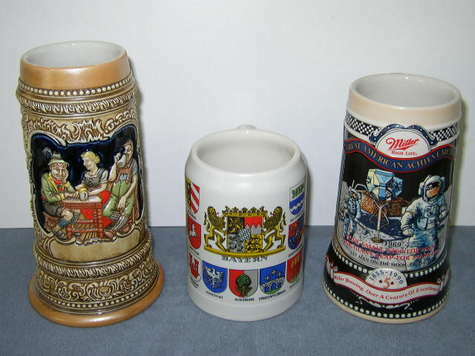 Beer Steins - All Date from the 1980's. Measurements are in inches high (from bottom of mug) and Wide (rim across to handled side). Excellent Condition. No Chips, No Cracks. Happy to email more pics - just ask ! Item #1 -- Ceramarte Beer Stein - Busch Garden's Germany. Made in Brazil. Measures approx. 8 x 6-1/4 inches. Item #2 -- Ceramarte Bayern - Bayern City Shield & around the rest of the Mug are other City Shields from around Germany. Made in Brazil & a Nice Heavy Mug. Measures 5 x 6 inches. Item #3 -- Miller High Life Mug - Great American Achievements 1969 ""one small step for man, one giant leap for mankind - 1st man on the moon Apollo 11"" - NASA 1855-1990 *5* Miller Brewing, over a Century of excellence. Bottom is stamped: 08848 Great American Achievements, Made in Brazil for The Carolina Collection Division of CUI, Inc. Fifth in the a Series. Measures 7 x 6 inches. Selling Miniature Steins & Shot Glasses too -- See them & all my items for sale in my online store !